It takes a lot of money to build a TLD into a brand, explains Colin Campbell. 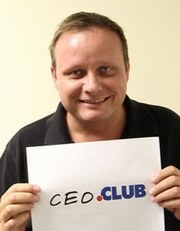 Colin Campbell’s .Club generated $7 million in sales of new TLDs last year, but lost $1 million overall. What does this mean for .club and other TLDs? How much do you have to invest in marketing to make a domain viable? Colin never evades questions, and this is a great interview. Also: lots of lawsuits, Neustar to split in two, Enom’s new site and Hillary uses a .biz. Great interview, Thanks for all your hard work. I appreciate how honest Colin is about the .CLUB business. In the future if they have open positions I would definitely apply. It’s a good model to only focus on one domain extension. It has a clear use and they have shown they are marketing to everyone. As Colin stated they are willing to run discounts but not dilute the .CLUB extension with crazy promos. Wish the podcasts I used to produce were such good audio quality. Do you mix the shows yourself or have an A/V person help you?